Aadhithya Anabahan is a Barrister specialising in Criminal, Regulatory, and Housing law. Aadhithya is regularly instructed in an array of criminal proceedings including Defence work in the Crown, Magistrates and Youth Courts. She has a strong Crown Court practice, both appearing for Defendants and the Prosecution as a Grade 1 CPS Panel Advocate.She is noted for her methodical and analytical approach and is considered to be a fearless and forthright advocate, whether Prosecuting or Defending. She also enjoys a wide and varied regulatory practice, through which she has represented education boards, local authorities and the police in a range of hearings from closure orders and non-police prosecutions to parole board hearings and tribunal matters. Aadhithya is often instructed in a range of regulatory matters before the Magistrates and Crown Court and is well-versed in the conduct, law and procedure of such cases. Aadhithya routinely appears in the full range of housing matters including possession, anti-social behaviour injunctions and breach proceedings before both District and Circuit Judges. Aadhithya is considered to be an eloquent, articulate and persuasive advocate with gravitas beyond her years. She is noted as having an approachable and highly likeable manner with clients, solicitors and judges alike. Those instructing her are willing to trust Aadhithya with cases well beyond her call due to her keen eye for detail, client care, impeccable conduct and preparation. Aadhithya is firmly committed to the global advancement of access to justice and in 2018 spent time volunteering with the African Prisons Project (APP) in Kampala, Uganda. Her time in East Africa included delivering legal aid clinics and advocacy workshops to maximum security inmates, in order to further their legal education and equip them with the necessary skills to represent themselves and their peers in Court. Prior to joining St Ives Chambers, Aadhithya spent six months working in the USA with the Jackson, Mississippi Office of Capital Post Conviction Counsel, investigating and providing legal services on final stage Death Penalty cases. During this time Aadhithya routinely met and conducted conferences with clients incarcerated on “death row”, interviewed a wide range of witnesses, professionals and jurors and investigated historic crimes. This was done alongside the general breadth of paralegal duties such as drafting notices of appeal, skeleton arguments and extensive legal research. Aadhithya has particularly valuable experience dealing with vulnerable individuals and those with mental health concerns through time spent working in the NHS with the Greater Manchester CRISIS outreach and Mental Health Teams. During this time she operated the Mental Health Services help line and is familiar with psychiatric and psychological assessments of those with a wide range of mental health and learning difficulties. 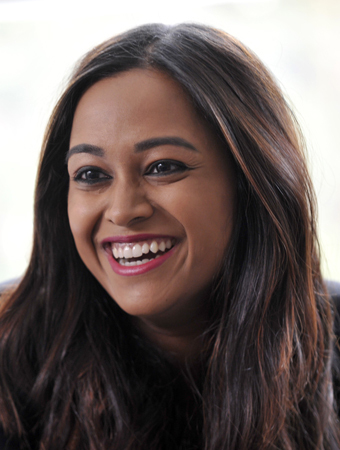 Before commencing pupillage, Aadhithya was employed by the Civil Service as a Home Office Presenting Officer, representing the Secretary of State regularly in Asylum, Human Rights, EEA Regulations, general Immigration, Points-Based System, Entry Clearance and Visit Visa appeals at the First Tier AIT Tribunal. A keen participant in Mooting and Mock Trial competitions over the years; Aadhithya ranked 1st with the Durham University team at the 2012 preliminary UK National Rounds of the Philip. C. Jessup International Moot Court. Aadhithya is also active as a moot court judge and regularly judges competitions such as the Oxford University Press moot competition national semi-final, the University of Law GDL mooting competitions and both oral and written components of the Phillip C Jessup International Moot. She also supports school mock trial teams as a Barrister mentor. Aadhithya has served as an elected member of the Young Bar Committee (YBC) since 2016 and is the current Midlands Circuit representative. She is also one of 11 nationally selected Bar Council Social Mobility Advocates for the #IamtheBar campaign. Aadhithya is currently a Visiting Guest Lecturer with the University of Law, Birmingham on both its LPC and BPTC courses. Click here to view the Privacy Notice for Aadhithya Anbahan.